The 1926 Harley line up for the J series motorcycles did not change – the proven 4 remained – the 61 cubic inch J Solo & JS Sidecar – which retailed at $315, and the larger and more expensive 74 cubic inch JD Solo and JDS Sidecar which sold for $335. The smaller J motorcycles sold 3,749 and the larger and more expensive JD Harleys sold 9,544 about the same as the previous year. It was the first year Harley offered a muffler cutout to deflect the exhaust gasses away from the rider. These models also featured a switch panel with a key lock and control levers. The line up did not change for Harley in 1927. The same four J and JD models for the street but several new ones on the specialty side. They included the Harley JK Special Sport and the Harley JDL both with generator ignition. 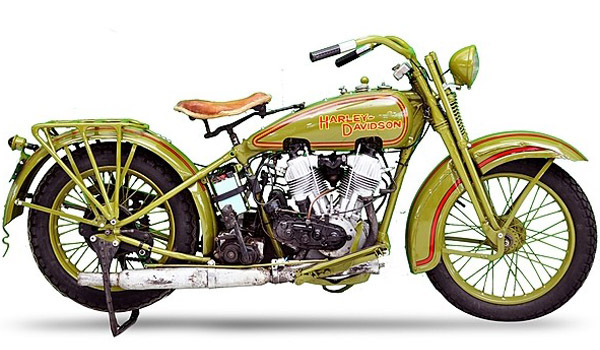 in 1927 Harley sold 3,561 J models for $310, and 9,691 JD motorcycles for $320. Harley introduced the “wasted spark” ignition this year with the distributor less ignition using a circuit breaker and single coil to fire both spark plugs at the same time.